At the beginning of the year, our Finance Director Julian Davis set out to take on eight gruelling physical challenges across the UK to raise money for our Charity of the Year, Little Hiccups. Julian has already tackled dark tunnels and ice baths at the Yorkshire Warrior and is set to finish the year with a 105 coast-to-coast walk, completed on foot, bike and boat. Now over halfway through his scheduled events, Julian has decided to clock up a few extra miles. 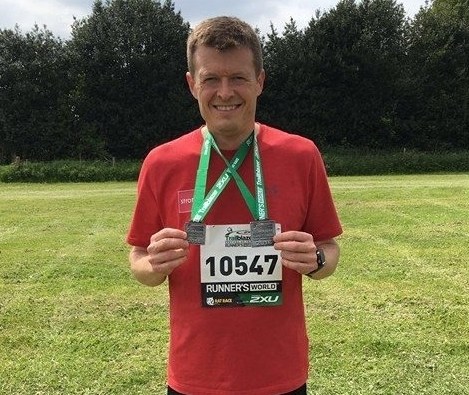 Not only did he run the Trailblazer Half Marathon on Saturday at Clumber Park, he also signed up to run a 10k shortly afterwards, ending the day with over 19 miles under his belt in under 3 hours. What an amazing achievement! After a short break through June, Julian will take on his biggest challenge yet - Man vs Lakes. At 26 miles, he’ll need to be ready to climb, walk, run, swim and navigate an intense floating obstacle course. Wishing you the best of luck with your training, Julian. To find out more about Julian’s upcoming challenges and to donate to Little Hiccups, click here.